One of my favourite places to take a rest near the Colloseo Metro stop is a little corner in the garden on the right side of the Capitoline Hill, the smallest of the Seven Hills of Rome located between the ancient Field of Mars and the Forum. In ancient times, the Capitoline Hill was for the Romans what the Acropolis was for the Greeks. Here the Romans worshipped their gods in three very important temples, the temple of Juno, the temple of Virtus and the most important, the temple of Jupiter Optimus Maximus Capitolinus whose size and importance rivalled the Parthenon in Athens. Here too was located the Tabularium (which can still be visited today), and served as the Roman Empire’s main archive. During the Middle Ages, Michaelangelo was asked to redesign the square and all the existing buildings around it, this is the Campidoglio as it exists today. ﻿ I like climbing the Cordonata, the humongous staircase leading from the bottom of the hill to the piazza. From the top of the hill, behind the piazza, one is treated to a glorious sight of the Forum and the full length of the Via Forum Imperiale. There is a nice breeze that flows almost continuously in this little garden. Benches are there for the weary and there are even times when I’ve sat there with a book and a flask of coffee. The book doesn’t get read much as the peacefulness and the beauty of the garden can lull one into a semi-catatonic state. There were times; however when I allowed myself to be lured into the Capitoline Museum, the oldest in Rome started when Pope Sixtus donated some bronze statues to the people of Rome and located them on the Capitoline Hill, way back in 1471. Let’s see, I think I’ve gone in 4 times already, once with my daughters, once with friends, and twice by myself. There’s a lot to see but I do have my favourites. The very first thing, upon entering the museum, located in the courtyard and completely unavoidable because of its size is the statue of Emperor Constantine, rather the dismantled statue with some massive body parts displayed lined up on one side of the courtyard. In the new wing in the center of its glass covered hall is found the original Equestrian Statue of Marcus Aurelius, a truly awesome sight! As I walked around and almost under the belly of his great giant horse I caught glimpses of the original shinny bronze through the enveloping patina of age. The Statue of Marsyas, who challenged Apollo to a singing contest and for his temerity was condemned to being flayed alive is also very unforgetable. The artist used a violet veined marble to render in dramatic fashion the livid color of his tortured body. 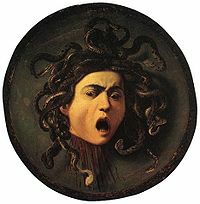 and Bernini’s Medusa, a most sympathetic rendition of this serpent-haired, hater-of-man, mythical creature. As I looked at Bernini’s Medusa, I could not help but compare this with Caravaggio’s. But what brought me time and again to come back into the museum is Him....The Dying Gaul.